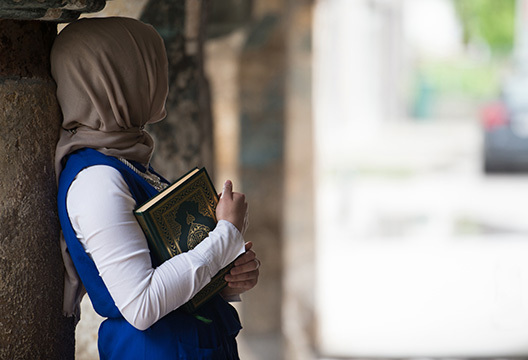 As part of her doctoral research social psychology PhD student Amena Amer (London School of Economics) explored the identities of an interesting group – those who are Muslim, British and white. Broadly, Amer was hoping to unravel how white Muslims challenge the generally held idea that Islam is a faith made up of people of colour, and how white British Muslims deal with a dual identity – being part of a majority from an ethnicity point of view and simultaneously belonging to a religious minority in Britain. The 2011 census showed almost 5 per cent of the population in England and Wales identified as Muslim, with 8 per cent of those identifying as white British or white (other). Amer looked into how people juggle these identities in interviews with 26 white British Muslim people, 24 of whom had converted to the religion and two having been Muslim from birth. Through a detailed analysis of these interviews she established three themes: the first being feelings of misrecognition. Participants spoke of their exclusion by their white ingroup, both in their own families and in the experience of Islamaphobia from the general public. One woman mentioned her family expected her to start ‘acting Asian’ after she converted. Some members of the Muslim community expected white British Muslims to only temporarily convert to the faith. The second theme to emerge was the participants’ experience of strategically managing their identities. One man mentioned he lived in an area with a good deal of anti-Muslim sentiment, so did not mention his faith to people in the area until they knew him well. Some said they would not wear the hijab in white circles, but they liked to wear it amongst other Muslims for recognition of their faith. Finally, some of the white British Muslims spoke of resisting the erasure of their identity. For example, one man was asked his name, James, by a fellow Muslim which was followed up with ‘No, what’s your Muslim name?’. Amer said when we think about recognition of our identities, who recognises them in what context and which identities are at stake, it can help us to better understand the ways we negotiate identity in the social world. As a white British (revert) Muslim myself, I find the subject naturally of great interest. The above report from conference gives a glimpse of some important insights. Might it be possible to obtain fuller information on Amena's research and findings?